Pair of Kaleeras in light gold colour and maroon red. Set with diamante stones. Approx. max width: 4.5cm Please take care not to rub our budget range kaleeras as this can cause the stones to fall. We advise you pack them flat and loose to store at home. Thus spare white stones will be provided. 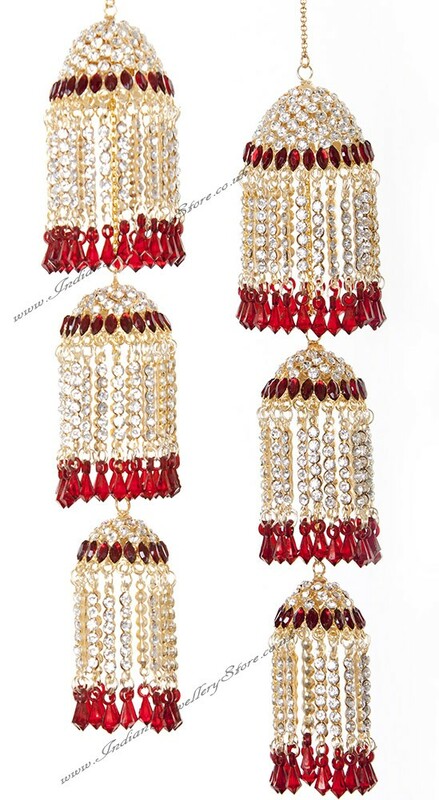 Pair of Kaleeras in light gold colour and maroon red. Set with diamante stones. Approx. length: 25cm Approx. max width: 4.5cm Please take care not to rub our budget range kaleeras as this can cause the stones to fall. We advise you pack them flat and loose to store at home. Thus spare white stones will be provided.